Appearance: Gin has silver hair, always grinning and keeps his eyes closed, giving him a fox-like appearance. "He is unusually thin and tall with very sharp features giving him a skeletal appearance." At first appearance he dosen't look very powerful. In Soul Society his outfit wasn't modified at all. 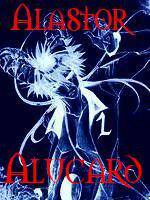 "In Hueco Mundo, his outfit, like Aizen's and Tōsen's, has been modified since the three abandoned Soul Society. He now wears a long, white robe over his normal Shinigami hakama. 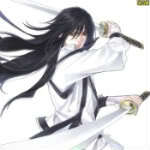 The hilt of his Zanpakutō is visible sticking out from under the robe through the opening down to his waist. Later Gin is seen wearing a white hakama like the Arrancar, instead of the black ones he was last seen in. Gin wears his robe open in a narrow 'V' down to his waist, closed to below the hips, and then open again to the hem, which falls about mid-calf. His robe has long bell sleeves, into which he hides his hands like one does with kimono sleeves. The lining of the robe and edges or layers of the under-robe(s) appear to be black. From other examples, it is likely he is also wearing black tabi with white waraji. His Zanpakutō is not visible with this outfit." Personality: "Gin is one of the most mysterious Shinigami in the series, since his almost constant smile and slitted eyes, combined with his heavy use of sarcasm and mocking politeness, make it very difficult to discern his thoughts. Many find his demeanor and appearance rather unsettling and there are very few who were willing to trust him even before he was revealed as a traitor. Gin seems to be fully aware of the effect he has on others and more than once has been seen toying with people's emotional states for his own amusement. Both Rukia Kuchiki and Wonderweiss Margera have shown to be rather frightened of him, Rukia noting to herself that she felt like she was being strangled by snakes whenever he spoke, even if he was not speaking to her directly. Gin speaks with a distinct Kyoto dialect, which is polite but indirect. Ever since he was a child, dried persimmons have been his absolute favorite food. Gin planted and raised many persimmon trees around the 3rd division offices, and makes the dried persimmons himself, then distributes them to other divisions. Once he wound up eating a dried sweet potato, thinking, "Oh, it's a dried persimmon!" and he hated it. When he has free time, Captain Ichimaru goes on walks around Seireitei. Although his hobby is people-watching, it seems like he is possibly hunting around and searching for an opportunity to create mischief with some poor victim. He also has incredible skill at needle threading." Gin is also known for his speed. With his slim body, he is adept to avoiding attacks and getting around his opponents. Backround: "Not much is known about Gin's early history, except that he once saved 10th Division Lieutenant Rangiku Matsumoto's life when they were younger, as she was on the brink of starvation. He told her that if she had collapsed due to hunger, she must have spiritual energy. She recognizes that he must have spiritual energy as well, as Gin introduced himself. Approximately 110 years ago Gin graduated from the Academy after just one year, and was given a seated position in the 5th Division. When he met Aizen for the first time he already killed the 3rd seat of the 5th Division, referring to him as worthless. Aizen immediately gave him the 3rd seat of the Division after the incident, which they both kept secret. 9 years later Gin is shown to be involved in Aizen's plot and assisting him in the Hollowfication of high ranking Shinigami. He is present at the Hollowfication of the investigation team sent by Captain-Commander Yamamoto. He watched the conversation between Shinji Hirako and Aizen. He didn't seem surprised at the arrival of captains Kisuke Urahara and Tessai Tsukabishi. Aizen proceeded to leave the scene of the crime with his henchmen, stating that "there's nothing more to do there". To stop them from retreating, Tessai performed Hadō #88, Hiryugekizokushintenraiho against them, only to be countered by Aizen using Bakudō #81, Danku, enabling their escape. Gin eventually became the captain of the 3rd Division around the same time that Byakuya Kuchiki became captain of the 6th Division (less than 49 years ago). Gin however, even as a captain of his own division, was still a loyal subordinate to Aizen." Sealed Zanpakuto Appearance: "It looks like an ordinary wakizashi. The hilt is light-blue with a tsuba made of two slim swirls of metal looping around the blade to make an open oval, resembling an "S"." Release Command: "Shoot to kill" "Ikorose"
Shikai Look: "glows white and extends"
Shikai Ability: "extends at high speed to impale Gin's opponents from a distance. The blade also carries tremendous force when extending" "In addition, Gin can maintain the extension and swing the activated Shinsō in wide arcs, attacking multiple targets quickly and simultaneously. Shinsō is capable of reaching a maximum length equivalent to one hundred times its original length, earning it the nickname Hyapponzashi (Hundred-span) when Gin was younger." Bankai Ability: "As Kamishini no Yari, the blade is capable of reaching lengths equivalent to 13 kilometers (roughly 8.1 miles) at 500 times the speed of sound. The blade can also retract to its normal size at the same rate. Bankai Special Ability: Gin's Bankai essentially possesses the exact same abilities as his Shikai, but its power, length and speed are vastly amplified. The blade's tremendous cutting power is significantly increased, to the point where Gin is capable of swiftly cutting an entire town in half with a single stroke while standing a great distance away. * Hypersonic Blade Extension and Contraction: The deadliest aspect of Kamishini no Yari is not within its destructive potential, great length, or wide sweeping range, but rather within the speed with which it can extend and contract its blade. Gin's Bankai can achieve its full length at 500 times the speed of sound: exactly 171,500 meters per second in order to arrive at its full length of 13km in under 0.08 seconds, which makes Kamishini no Yari not the longest Zanpakutō, but the fastest. Because the blade's extension and contraction speed is his Bankai's greatest ability, Gin tends to downplay its speed whenever he talks about his Zanpakutō, and instead focuses on the length and range of the blade in order to gain a psychological advantage over his opponent. * Butō (Dance (Step)): By adopting a stance where he firmly grips Kamishini no Yari with both hands and places the Zanpakutō's hilt squarely to the center of his chest, Gin is able to unleash the tremendous extension and contraction properties of his Bankai to an even more terrifying extent than its normal state. This occurs in the form of a piercing maneuver where the extension and contraction of the blade becomes almost completely-unseen to even the most-diligent of observers. * Butō: Renjin (Dance (Step) Serial Blade): This ability repeats the action of extending and subsequently contracting Kamishini no Yari, as observed within the technique Butō, multiple times in rapid succession. The entirety of this process is completed in a mere moment, resulting in the individual steps involved in this technique becoming virtually indistinguishable from each other, generating an apparent mass of numerous blades that leaves little opportunity for the intended victim to evade successfully." Kintana just looked at him. For a while she didn't know what to do. There was no way she would give him such info. Did he take her fear of Aizen that great? A simple insult wasn't a huge issue. But giving then enemy details? Now that was just asking for it. She would be automatically blamed when it was found out they knew their way around here. She was the only one to have such contact with them. Not only would she be punished but she as betraying Gin, and that was the last thing she would do. With that though in mind she went up to him again with her sword drawn. She took the hint and hit his bad leg. She didn't aim to go too hard but just enough to make him wince in pain. She was done letting this one mistake let someone so weak command her. She didn't have to listen to anyone but the Espadas and Captains and she didn't plan on it. "Your out of your mind. Maybe I should just knock you out good enough so you forget this all or make it seam like a dream. It wouldn't be that hard with all the pain and pain killers. Your not holding this over me. Once I'm done with my duties I'll just tell Aizen-sama myself. The worst that will happen is Tosen-sama uses me to sharpen his sword. This is just the reasons I don't like you shinigami...."
She couldn't finish, someone had walked in. The silver fox stood in the door way smiling at them. Kintana was leaned over Yumi holding her sword at him. Now would be a time to panic. Gin said nothing. He simply took out his blade. The sword ran into the arancar's leg and pinned her to the ground. "Now now, that wont do. Don't go breackin my toys. You were only sent here to watch over it and make sure I could still play with it. Naughty arancar." She winced in pain for a moment but did her best to hide it. This was the first time she was impaled with something but she dare not say anything, she knew she deserved it. But Gin was standing there, smiling, with his sword in her body. He was thinking for a few seconds before he removed his sword and put it back in it's sheath. "Now, what were ya two arguing about. I could hear ya down the hall"
Kintana couldn't make eye contact with him. She stood up and looked to the ground when she answered. She did it quickly so Yumi wouldn't have a chance to say anything. What worst could he do at this point anyway? Gin was much easier to deal with then Aizen or Tosen anyway. Even if she already annoyed him it was better off she told him everything before Aizen found out. She picked her head up slightly only to bow. "Forgive me, Ichimaru-sama. I slipped my tongue. I spoke lily of Aizen-sama without meaning to. I didn't wish for him to say anything in fear of punishment. I was on my way out to inform Aizen-sama of it once I was finished with my duties. If you don't need me any more, sir, I will go to do just that." She kept her eyes closed tightly and stayed in a bow after she was done. She wouldn't get up until Gin said something. But he stayed slightly, paying her no mind and walking over to Yumi. Gin placed a hand on Yumi's damaged leg being careful to not hurt him. "It would be no good if we returned him all battered. Get new bandages and tend to his wounds." Kintana nodded, fixed her clothing and ran out the door as fast and best she could, almost falling many times. She wouldn't be able to tend to her own wounds for a while so she had to bare with it for a while. She was soon gone and only Gin and Yumi left in the room.